In the world of credit card scoring, many consumers aren’t aware that credit card lenders can utilize various credit scoring reports to determine your creditworthiness -- indeed, there are dozens of ways your score can be calculated. While there isn’t exactly a “secret sauce” for the calculations, Vantage Scores and FICO Scores will often report different numbers within the 300 to 850 ratings. The importance of understanding which score a lender uses can mean the difference between obtaining a credit card (or any other type of loan) and being denied credit. The Fair Isaac and Company (FICO) was founded in 1956 and, in 1989, rolled out the first all-purpose FICO score. Prior to 1989, each lender had their own internal system for giving the final say on whether or not to extend credit to individual applicants. 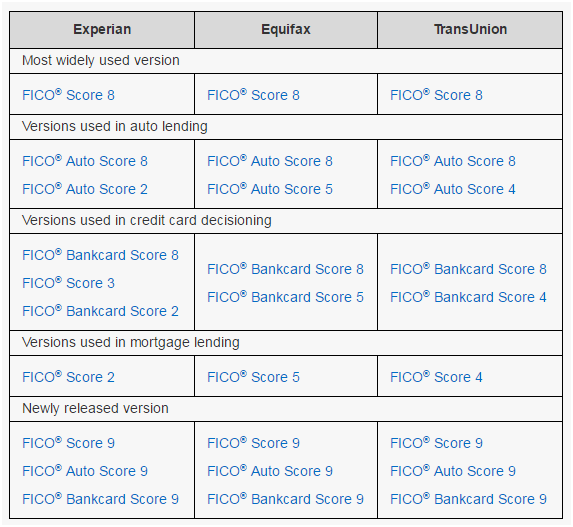 Since that time, there have been additions to the FICO scoring inventory. What does this mean? FICO offers different scoring products based on the lending industry. Add to this that your credit report score may differ between the Big Three, and establishing a definitive meaning as to your “creditworthiness” becomes more convoluted. But, there is more to this increasingly complex mathematical matrix. A new credit score calculation competitor entered the market in 2006: VantageScore. Experian, Equifax, and TransUnion collaborated to create a credit scoring system that rivals FICO and, for the time being, is used for 10% of the lending decision in the U.S.
Due to the variations in credit reporting and scoring, lenders may ask for proof of your income (yes, even for credit cards), the length of time you’ve been employed at your current job, and how long you’ve lived in your current home. You should review both scores on a regular basis. Granted, FICO is the most widely used, and if you are paying a service to monitor your credit score, then the FICO score is the preferred choice. At this time, the FICO score is the primary calculation that Fannie Mae and Freddie Mac require if you’re seeking a home loan through either of those government entities. So, if you’re considering the purchase of a home with the assistance of either institution, then focus on your FICO score. In terms of credit scores, the VantageScore is provided when you receive a free credit score from one of the Big Three reporting agencies. Therefore, it’s more easily accessible and as it gains in popularity -- which according to VantageScores.com it is increasing in industry usage -- you’ll want to make sure your score is being reported accurately. Fortunately, for now, there are only two major credit scoring calculations that consumers need to focus on. Keep in mind that both FICO and VantageScore continue to evolve and update how they calculate your score. However, the more you adhere to the essential components of excellent credit (as listed above), the more likely you’ll achieve a high score for both FICO and VantageScore.